The Accessory Boxes- Page 1. The Illustrated Accessories List - (Page 1). Subbuteo Accessory boxes :- Page 1 (this page), Page 2. There is no doubt that toy boxes have great appeal. After all, they are the things that stared down at you in the toy shop, and were specifically designed to tempt you away from all the other goodies surrounding you. 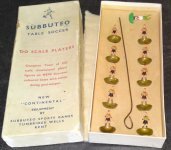 Subbuteo differs from most of the other toys of the last fifty years in the percentage that still remains boxed. If I had to guess some figures, I'd say that only ten percent of toys from the 1970s will still be in their original boxes, whereas for Subbuteo, the figure would be nearer eighty percent. This does make collecting Subbuteo by box type easier and cheaper than with other toys. Airfix, that other great scale model company, have many kits that remained unchanged for thirty years or more, so what collectors look for is the different boxes. Applying this logic to Subbuteo, may suddenly make you want to buy a couple more fences to collect all the different boxes. Well maybe. So the aim of these two pages (along with the team boxes page) is to help date Subbuteo for new collectors, illustrate different boxes for some of the long running items, and to help transport visitors back to those magical toy shops of days gone by. At present, the boxes are listed in a very rough date order, and everything look straight forward. However, I'm sure things will get more complicated! One of the things to look for when dating Subbuteo boxes is the different addresses. 1947-74 Langton Green, Tunbridge Wells, Kent. 1975-76 (Warwick Park) Tunbridge Wells, Kent. 1977-81 Chiddingstone Causeway, Tonbridge, Kent. The original accessories were mail order only, and so came in plain brown boxes. The flat card and celluloid teams didn't come in a box at all, but Peter Adolph produced a box you could buy separately to put the teams in once you had stuck them into their bases. By the time the 1960s came along, Subbuteo was beginning to expand away from its mail-order based roots, and this coincided with the launch of the OO scale range. The 1960-61 price list still stated that components were "obtainable direct from PA Adolph". The next year saw the arrival of the OO scale sets, and the instructions changed to "If unobtainable from your local stockist, order from Subbuteo Sports Games." The OO scale range launched late in 1961, and featured just the teams (C100) and floodlighting (C101), and a full box set that also contained both these items. The 1961-62 catalogue did not give "continental" reference numbers for the original sets. These original releases can be identified by the use of white box lids, rather than the usual green. Both teams and floodlights were sold in this style of box for a short period. Note that the team box was still using the 1950s Subbuteo logo. The white boxes must have been replaced relatively quickly, because the early track suited team (C103) had a green lid. Here is a selection of boxes featuring the kicking footballer logo from the 1960s. These boxes were used for the A-Z range, and the early continental range - probably up to C112 The Club Flag. In fact, I don't think C112 lasts long enough to feature in any other box. You can see that some of the boxes have the white border around the green which is also seen on the early team boxes, and some of the cricket accessories of the same era. There was also a multi-purpose box for balls, referees or flags. Although the greens shown here are not exact copies, they do show the variation in colour on the early boxes. The floodlighting box is now green, to match the rest of the range. This is a very plain bagged accessory. I'm guessing that C114, and the early version of C113 (police set) came in these bags, and they probably date from the 1968-72 era. This small figure only appears on a few boxes. On Set N, and NN he survives right through change to "C" numbers in 1977, when the boxes were reprinted. I guess the fact that there is no address on this box allowed its continued use. Late 1960s/Early 1970s illustrated Boxes. The increasing complexity of the range in the late 1960s leads to these first illustrated boxes. Most of the examples I have are for accessories first issued between 1969 and 1972, (i.e. between C115 and C128), plus items redesigned in this era - i.e. the floodlights, and half time scoreboard. As you can see, the boxes do not have a uniform feel. The 1970s version of the footballer logo makes an appearance on some of these boxes, but he's often tucked away on the side panels. Now these boxes are beginning to look more like a unified range. On these boxes we see a black football usually being kicked by the corner kicker, or saved by a diving goalkeeper. The 1960s accessories like the TV Tower and photographers have been re-boxed to fit into the range. However, just when it was all looking sensible, the ball boys and throw-in figure go back to the illustrated box idea. At least the ball boys are playing with the standard ball logo. Two versions of the card label are shown here. I think the version showing just the ball is the older of the two. This is where the Subbuteo address changes to Tonbridge. Most of the accessories seem to be completely repackaged into the "hobby crest" range shown on the next page, but a couple of sets have only minor changes. In the examples below, the C108 fence moves from a slide out tray to a lift off lid, but otherwise changes are slight. The corner kicker box is reduced in size, and no longer opens as a display stand, but again the design remains the same. That's quite enough pictures for one page. If you want to follow the box changes from the late 1970s to date, then please follow on to the final page of this box list.